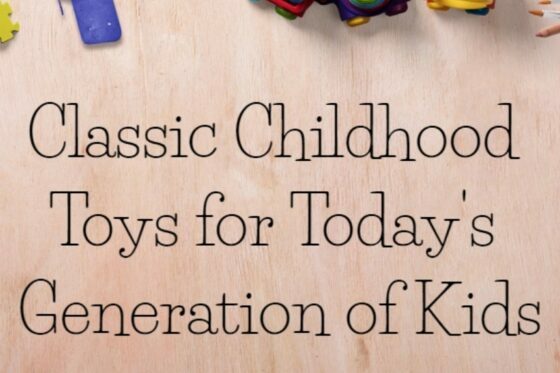 Where are all the ’80s babies? I remember watching Gumby on TV as a kid and getting so excited when it came on. Man, have cartoons come a long way… They may be different now, but Gumby will always be a classic. Wouldn’t you like to be able to watch his adventures anytime you wanted? Now you can! I have your chance to win The New Adventures of Gumby: The 1980’s, Volume 1 on DVD, and it comes with two bendable toys too. Thanks to NCircle Entertainment, it’s time to welcome back Gumby and Pokey in this wild, wacky, and inventive collection of ’80s episodes. Featuring 50 clay-animated episodes, fully remastered from their original camera rolls and soundtracks. Also making appearances are Prickle, Goo, the Blockheads, Professor Kapp, Dr. Zveegee, the Moon Boggles, and Gumby’s parents Gumbo and Gumba. 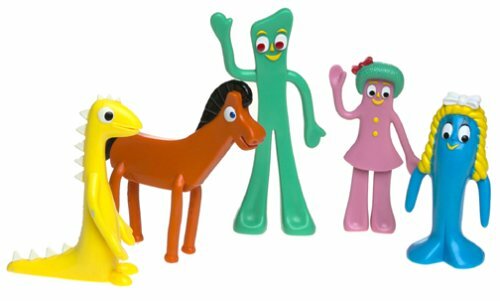 New characters include Gumby’s sister Minga, Denali the Mastodon, and Tilly the chicken! I know it’s been a long while since Gumby aired on TV, but do you remember all of these characters? As much as I love Gumby, I can only picture his friends, family, and of course, the Blockheads. I think we may need to start watching this 2 disc set for family night this week, so I can brush up my memory. My kids have already had occasion to go on some adventures with Gumby and even have a bendable toy figure of the green guy. Add to that the bendable figures of Prickle and Goo that come with this set, and it’s a party. Now we just need Pokey to make the gang complete. 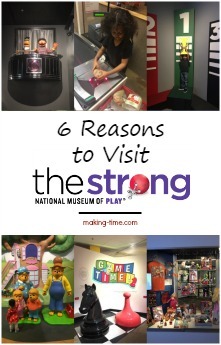 Want to enjoy an old school classic with your family? 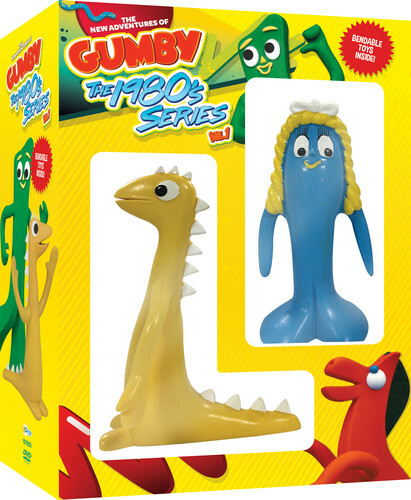 This is your chance to win a DVD copy of The New Adventures of Gumby: The 1980’s, Volume 1 with the bendable figures of Prickle and Goo included. Just enter using the giveaway form below. Good luck! Who was your favorite Gumby character? 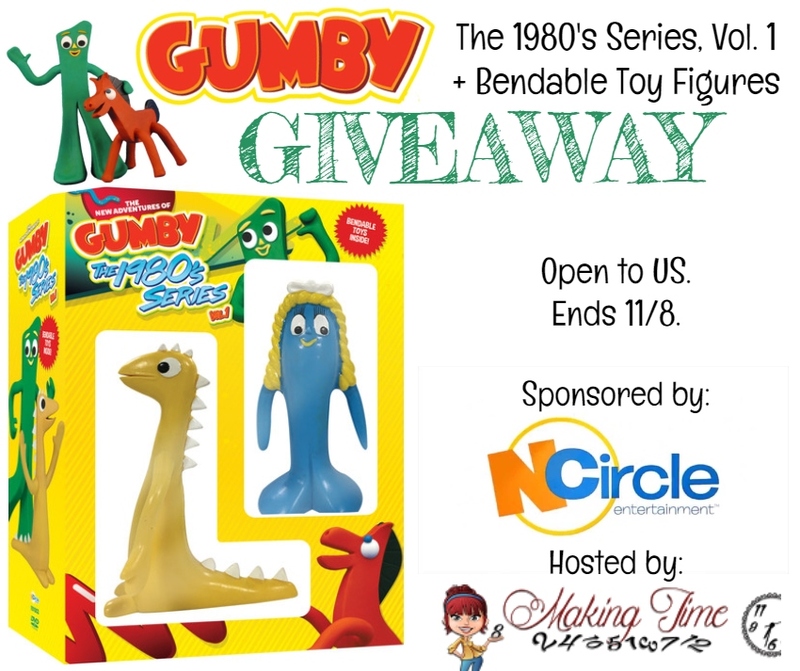 One lucky Making Time reader will win a copy of The New Adventures of Gumby: The 1980’s, Volume 1 on DVD, with the Prickle and Goo bendable figures included! Good luck! 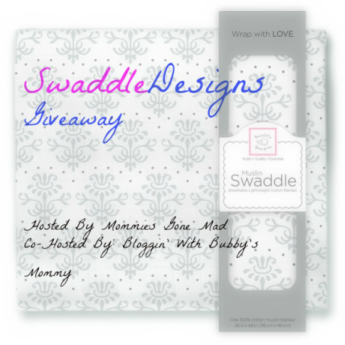 This giveaway is open to residents of the US, ages 18+ and ends on November 8, 2018 at 11:59 pm est. Random winner will be notified via email and must respond within 24 hours or prize will be forfeited. Sponsor is responsible for prize fulfillment. Goo was always my favorite. I love these characters! Thanks for the super giveaway opportunity!